This page continues the story of the south side of the area, now known as The Square, situated at the western end of the High Road in Beeston. It explores the history of the area on which the shopping centre now stands and presently (2011) occupied by various shops including Birds, Peacocks, McCulloughs and Ashley Peakes. In the memory of many older residents the area was occupied, before the shopping centre was built, by the much-loved Boots the Chemist building, by the long-established Doars grocery store and the National Provincial Bank on the corner of Station Road. As always, we will explore the detail behind the buildings, the personalities who built, lived and traded here and something about the earlier history of the site. By the latter part of the 19th century the area that we are looking at was the site for a somewhat eclectic mixture of homes and business premises - as can be seen in the photograph shown below. It was towards the end of the 19th century when house numbers were allocated and gradually began to be used. The group of properties shown here, the subject of this current study, were even-numbered, 2-10 High Road, right to left in the photograph, beginning with the property occupied by C P Hull. The properties further to the right are the Church Street properties we examined on the previous page. The cabs in the foreground are those operated by William & George Oldham, whose office can also be seen. We can date this photograph reasonably precisely as 1904-1906, based on the names of the tenants that can clearly be seen over two of the shops - and which will be looked at in more detail below. This date is important to our story as it shows the properties on the eve of a redevelopment in 1907, that would last, essentially in the same form, for a further sixty years (A era which we will examine later on this page) until its demolition and the building of the shopping centre that exists today. It is appropriate, therefore, to look at the site before and after this watershed point in its history. Pre-1907 History of the Site - The persons responsible for developing the site to the stage that we see in the photograph, were William Roberts (1793-1867 and his sons, notably his eldest son, William (1826-1917). As we will see, both men made very significant contributions to the development of Beeston and, indeed, even in the wider local area. The senior William Roberts was born in 1793 in Aston on Trent, the village in the south-east corner of Derbyshire. Like a significant number of others in this era, he had moved to Beeston, probably with his parents while he was young 1. In 1822 William married Elizabeth Foster, from Radcliffe on Trent, Notts, the brother of Robert Foster 2. 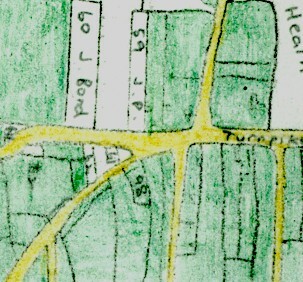 By 1841, both William and Robert's families had established themselves in the centre of Beeston, in the Roundhill area of Beeston, on the opposite (northern) side of what is now The Square to our present focus on the southern side, but then, of course, on the other side of the Sawley/Nottingham Turnpike running along the northern side of the village core. From that base, William operated as a tailor while Robert's son - also Robert - went on to play a leading part, based on his trade as a joiner, in the local firm Foster & Pearsons - something that will be explored further when we look at the northern side of The Square. The map on the right shows the area around what is now known as The Square at the time of the Enclosure of Beeston in 1809 3. The Sawley/Nottingham Turnpike, now Chilwell Road and the High Road, can be seen clearly running left to right, widening slightly where The Square is now, Church Street running from there towards the bottom left had corner, Brown Lane (now Station Road) running down from the eastern end of The Square with Butchers Lane - then, as now, slightly out of line relative to Brown Lane - continuing as Cowgate Road (now Wollaton Road), heading north. The areas coloured in green are those parts of the village - mainly in the village core - that were already in private hands at the time of enclosure of the open fields. To the south of the turnpike, the old village core included many ancient crofts where small-time farmers and cottagers still worked the land. Essentially, this would have been the position when William Roberts senior arrived in Beeston and settled, alongside Robert Foster's family on the North side of the Turnpike. The land opposite, on the corner of what was then Brown Lane consisted of two ancient crofts (roll your mouse over the map to highlight the area) the northern parts of which Willian Roberts was able to acquire between 1832 and 1849 and on which he - and more particularly, his son - made most of the developments which may be seen in our main picture above. His individual acquisitions may be seen in more detail in the plan shown here on the left 4. The piece marked 'A' (coloured green) was acquired at auction on 18th July 1832, part of the estate of William Barker who had died in March 1820, followed by his widow Mary in May 1831. The property had been the property of one William Drury who died in 1773, leaving his Beeston property to his children who, in 1785, sold it to William Lowe of Nottingham. In 1788, William Lowe left his Beeston property to Mary Read for life, then to her daughter Mary for life and then to her children. The younger Mary had married William Barker in 1792, when the latter took possession of the propery in right of his wife, soon afterwards took down an existing cottage and erected ten small houses. The couple had at least eleven children, nine of whom inherited after their parents died. The legal aspects of all this were not without their complications and it was not until January 1833 5. that William Roberts was able to acquire a clear title to the portion he had purchased at auction over six months earlier. This consisted of 460 square yards and included three of the ten houses. 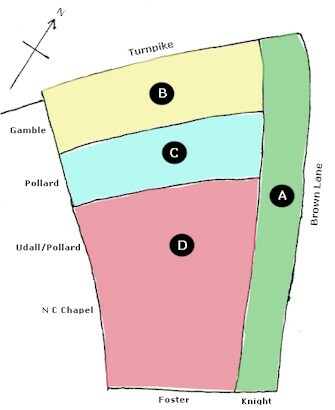 The other pieces (coloured yellow, blue and pink respectively) were part of the left-most strip highlighted on the above enclosure map, and known as 'Brown Lane Croft' (or sometimes 'Maltbys Croft'). In 1736, the land had been in the possession of Sarah Constable, the latest in this family who had held this and probably other lands in Beeston. In that year she married William Dunsmore, a butcher from Scalford, Leicestershire after agreeing a marriage settlement in which they exchanged joint tenencies in their respective lands in Beeston and Harby, Leicestershire. Several generation later, the Beeston land was in the possession of another William Dunsmore, the latest descendant of the earlier William & Sarah 6. In 1839 he sold Piece 'C' (coloured blue) to Roberts having, apparently sold him Piece 'B' (coloured yellow) some time earlier 7. In 1849, Dunsmore sold Piece 'D', some 958 square yards, to Roberts. Overall,the land aquired by Roberts, including all four pieces, totalled about 2038 square yards. No evidence has been found that William senior personally occupied this land or its buildings although it does appear that he built a butchers shop on the High Road frontage (possible the building occupied by Wharton in the 1903/4 photograph above) and that it was occupied by Joseph Meads, a butcher, by 1871 and as late as 1888 8. We also know that an adjacent building - possibly the building partially occupied by Oldham in the 1903/4 photograph, was built 'by John Lee on the site of a dwellinghouse previously occupied by Ann Lilley, deceased', although this is difficult to reconcile with Roberts' known ownership and matching individuals have not been found 9. Overall, though, it appears that the property was used in Roberts' lifetime as an investment. By 1861, then aged about 68, William and Elizabeth had moved to Roberts Yard - presumably one of his developments - off of the eastern end of the north side of the High Road, Beeston, nearly opposite the top of Regent Street. Curiously, he is recorded on the census in that year 10 as a brickmaker while his son Edward operates the tailor's business from an adjacent property on the High Road itself. William died in Beeston in 1867 followed, in 1870, by his wife 11. Both were buried in the churchyard at Beeston where a memorial survives. William and Elizabeth Roberts had two sons, William (1826-1917) and Edward (1829-1909) and there was also two daughters, born in 1823 and 1825 respectively, who appear to have died in infancy. Edward followed his father's trade as a tailor and draper. He married Ann Elliott, the daughter of a Nottingham lace maker. At first, he traded in Beeston, possibly with his father but moved to Chesterfield, Derbyshire by the time of his father's death before returning to Nottingham, where he spent his retirement years, after his wife's death in 1889 12. William Roberts (junior) was born in Beeston on the 25th August 1826 and was baptised at the Parish Church there on 15th October in the same year. Although it is not clear where or with whom he was apprenticed, once he was trained he lost no time in establishing himself as a grocer on the High Road in Beeston 13. In 1852, he married Sarah Cullen, 14, one of the daughters of Thomas Cullen, a Nottingham builder and part of a remarkably successful Congregationalist family. William and Sarah were to have no children, indeed Sarah appears to have continued to live in the family home in Nottingham for much of the time. William, of course, needed to live in Beeston where his business was, but he was clearly trusted within the Cullen family, acting as an executor of the estate of each of Sarah's siblings. This would have been far more than a formality as all of their valuations were considerable - some several million pounds in today's value - and, in 1883, the family entrusted him with £5,000 - nearly £400,000 in today's values - to build and endow the Miss Cullen Memorial Homes in Sherwood 15. By 1871, probably following his father's death - when he appears to have inherited the property acquired by his father, described above - that he moved his business to that location, specifically on the corner of High Road and Brown Lane (The northern part of Piece 'A') and the eastern part of Piece 'B' together comprising his grocer's shop. By then, he was being assisted in the shop by John Frederick Doar who, from the age of 15 until his twentieth birthday in 1866, had served as one of Roberts' several apprentices 16. By 1873, it seems that Roberts had sufficient confidence in Doar's, ability and energy to leave the business in his care as it was in that year that he retired to live out the rest of his life at Acacia House on Acacia Walk, Beeston 17. Freed from day-to-day responsibility for the grocery business, Roberts turned his attention to other interests. In 1877 he was a one of the promotors and was appointed a Trustee of the St John's Grove Estate, the area of Beeston that includes Devonshire Avenue, Cavendish Place, Elm Avenue, Glebe Street, Vicarage Street and Newcastle Avenue, a prestigious development which set high standards for housing in the fast-developing town. He also took on many civic responsibilities - including membership of the Local Board, the School Board (from 1880), Trusteeship of the Wesleyan School (from 1891) and as an Overseer, later (from 1884) Guardian, of the Poor 18. In 1882, he and fellow Local Board member, Ben Collington, negotiated the purchase of the land for the cemetery on Wollaton Road and oversaw its layout and construction of the chapel. In 1901 he presented the organ, at a cost of almost £1,000, to the then new Wesleyan Church on Chilwell Road. In 1887, William's wife Sarah died and, reflecting her lifetime loyalty to her family, was buried with other members of the Cullen family in Nottingham General Cemetery. In the following year, Roberts married his first wife's cousin, Lucy Emily Cullen 19,+ then aged 35 - 27 years younger than Roberts; nevertheless, there were to be no children of the marriage. Lucy was the daughter of Sarah's brother, John Cullen, who had been a succesful grocer in Dronfield, Derbyshire 20. Now a widower, following his wife's death two years earlier. John moved to live with William and Lucy at Acacia House and died there ten years later in 1898 21. William Roberts, shown in his later years in the photograph here on the left, died in 1917 and was buried in the cemetery in Beeston which he helped to design and where is memorial survives 22. His widow later moved to Nottingham and died in Skegness in 1928 but is buried in Beeston Cemetery with her husband 23. In June of 1888, Roberts had made a significant move in connection with his property in The Square. It was than that he sold the whole of the property shown in the above plan 24 to his favoured successor for the business, John Frederick Doar. The purchase price was £2,375 which was part financed by a mortgage of £1,600 to Roberts himself. This left Doar free to begin to develop the property a phase which appears to have included the construction of the pair of properties immediately adjacent to those on Church Street 25. From about this time, these two properties were numbered 2 & 4 High Road, along with the existing properties which became numbers 6, 8 and 10. This makes them more easily tracked on the census returns and in other records. 2 High Road - this was the property immediately adjacent to 1 Church Street. As such, it was the one on the right of the pair of shops, apparently built about 1890, after Doar had acquired the property from William Roberts. Like its neighbour at number 4, the shop premises had living accommodation above the shop and, it seems that this was not always occupied by the person who traded in the shop; we, however, will concentrate on the shopkeepers. By 1891 and up to about 1900, it was occupied by another William Roberts - also a tailor but not, as far as we can tell, obviously related to the previous owner of this property. Originally from Darley Dale, the son of the village blacksmith, he had moved with his family as a child to Lichfield, He arrived in Beeston before 1888, with his wife Mary Ann, where he took the tenancy of 2 High Road and opened in business as a tailor and outfitter. It was here too that their seven children were born 26. After just over ten years as a tailor's shop, the property was occupied by a series of confectioners as a sweet shop, a use that was to continue until the redevelopment of the whole site at the end of the 1960s. The first of the confectioners at number 2 was Emma Daykin who was living and trading there by 1901 with her husband Alec, who worked as a self-employed lace curtain draughtsman. Assisting in the business, and lodging there, was Emma's younger sister, Annie Raynor 27. They are known to have been there in 1902 28 but, by 1904, they had left and the business was in the hands of Miss Charlotte Penelope Hull 29, who had been born in Stamford, Lincolnshire in 1861, the daughter of William Hull, a broker, and Valentine, his wife. After her father died in 1864 and her mother in 1888, she supported herself as a dressmaker before moving to Nottingham where, in 1901, she was described as a manageress 30. If the move to Beeston to run a sweet shop had been a daring step, her next move was perhaps even more so. In 1906, at the age of 45, she left to marry Samuel Crawford, a 66 year-old widower, an electrical engineer living in Surrey 31. No explanation of how and why that came about has come to light so far ! The next tenant was James Monk, born in Market Harborough, Leicestershire in about 1845. He and his wife Mary had previously operated as grocers in Sturton, Lincolnshire and later in Harby. Nottinghamshire 32. James remained the tenant until after the 1907 watershed, when the properties entered the next phase of their history, which is described below 33. 4 High Road - this was the leftmost property of the pair, apparently built by Doar around 1890. In 1891, it was occupied as a fishmonger's shop by Robert Smith, assisted by his wife, Caroline 34. They appear to have been new to the trade as ten years earlier, in 1881, Robert had been working as an engine driver in a Nottingham gas works. In the event, he had soon moved on and, by 1901 he was with his family in Sheffield, trading as a grocer 35. 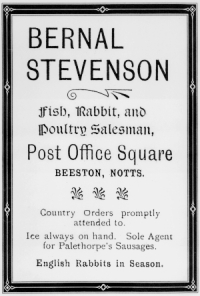 After the Smiths' departure, the property continued as a fishmonger's shop, but was now operated by Bernal Stevenson, born in Nottingham in 1866, the son of William and Phoebe (née Kirk) Stevenson 36. William had traded in Nottingham as a fishmonger before his relatively early death in 1881, aged 50, when Bernal was then only 15 37. Less than two years later, he had also had to face the death of his mother and was then left to continue in his father's trade 38. In 1887, he married Sarah Ann Ford 39 and, by 1891, they can be found, already with two children, operating a fishmongery at Stratford Terrace, in the Shakespeare Street area of Nottingham 40. 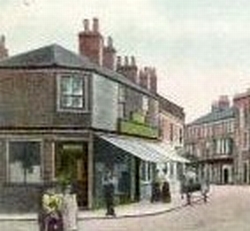 Before 1901, the family had taken over Robert Smith's fishmonger's business at 4 High Road, Beeston 41. The family was to trade there for well over 30 years. As we have seen, the couple had two children. Their eldest, Beatrice Mabel Stevenson (1888-1939) married Joseph Smedley (1881-1946), the son of a Beeston silk throwster, who worked as a clerk for a motor garage, apparently close to where they set up home at 11 Beeston Road, Old Lenton, were they raised three children 42. Bernal & Sarah Ann's second child was Bernal Hooton Stevenson (born 1891) who married Louie Bowley in 1912. They had three children : Madge (b. 1915), Frederick (b. 1919 and Donald (b. 1925) 43. By 1911, Bernal junior was assisting his father in the Beeston shop and was also pursuing an interest in boxing 44. However, in May 1915, all this had to be suspended when he enlisted in the Royal Field Artillery 45. Thankfully, he survived the War and returned to continue working with his father, probably taking more day-to-day responsibility over time. Towards the end of 1917, Bernal senior's wife, Sarah Ann, died; she was only 49 46. In June of the following year, Bernal, aged 52. married again, at Beeston - to Annie Selina Derry (1881-1925) who was then aged 37. Annie had grown up in Herefordshire, but as a young woman - certainly by 1901 when she was 20 47 - she became a servant in the household of William Goodacre Player (the son of John Player, the founder of the famous cigarette firm) at his grand home, Lenton Hurst, Nottingham, which now forms part of the campus of Nottingham University 48. Annie Selina was the cook to the large Player household for perhaps twenty years. 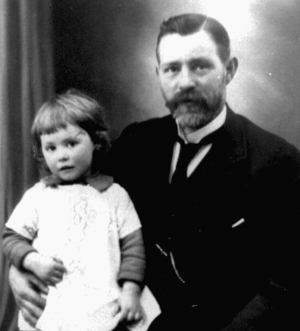 The couple had one child, Nancy Stevenson, who was born in 1919 and is believed to be the child pictured here with her father in about 1923. The couple's life together was to be a short one as Annie Selina died, aged only 44, at Nottingham General Hospital, just before Christmas 1925. She is buried in Beeston Cemetery, with her mother who had died early in the previous year 49. Despite all these setbacks, the business continued until 1934 when as we will see, a major change of use of this property took place. 6 High Road - when Doar acquired the property from William Roberts, the tenant of this property was Joseph Meads, a butcher and member of a well established farming family from Chilwell 50. No 6 High Road was part of a section of the overall property that was somewhat older than numbers 2 and 4 and it seems that he may well have occupied it at around the time of his second marriage in 1865. Then, he married Hannah, the widow of George Arthur Finlay who had also traded as a butcher on the High Road at Beeston but had died, aged only 29, in 1863 51. Both George and Hannah had originated from Shardlow, where George's father was a canal agent and Hannah's father kept the Navigation Inn 52. 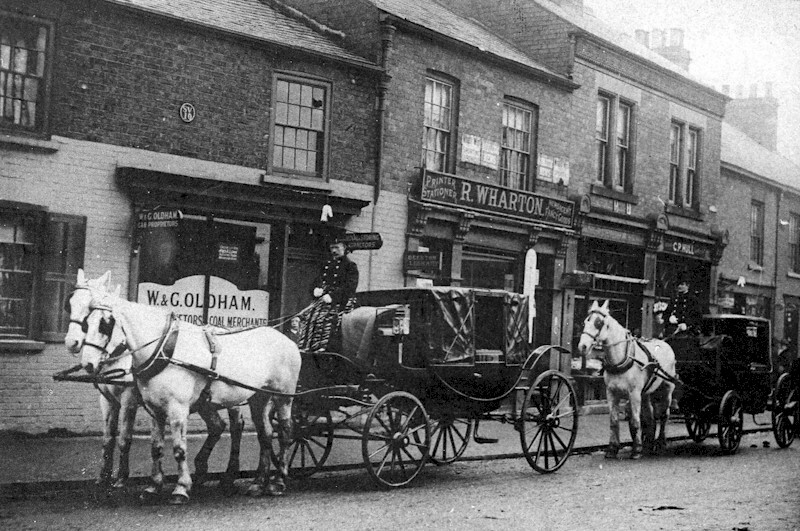 With a ready supply of meat from the family farm in Chilwell, the shop at 6 High Road, Beeston must have seen excellent business and Joseph and Hannah were to trade there for almost 25 years, until shortly before his death in 1890 53. Around 1891, the property was occupied briefly by Charles Hollingsworth with his wife Annie and their daughter. Charles was the second son, from a family of at least ten, of Edward, a Beeston tailor and his wife Elizabeth. He had started out as a butchers' boy and then worked for others as a butcher before starting on his own - although his time there appears to have been short as no trace of him or his family has been found in later records 54. What we do know is that, by 1901, the property was occupied by Ralph Robert Wharton and his wife 55 who opened there as a stationer, printer and newsagent. Ralph was born Ralph Robert Walker in Beeston in 1869, the son of Mary Ann Walker (née Nutt). Mary Ann boarded with Samuel Wharton, an engine fitter, whom she eventually married in 1871 56. Ralph started his working live as a cycle fitter, presumably at the Humber factory in Beeston and was still working there when he first moved to 6 High Road 57. In 1897, he had married Gertrude Belton 58 and it may be that the business was, at first, developed by her until it was mature enough to support the family. As can be seen in the photograph dated about 1905/6 at the top of this page, the business seems to have developed well by that time, and apparently included a lending library alongside the usual business of a stationer and newsagent 59. However, in 1907 Ralph died, aged 38, and the business closed at this location 60. 8 High Road - this is the property that is shown prominently in the photograph at the top of this page and is part of the older buildings on site. At that time - about 1904 - it was occupied by W & G Oldham whose cabs may be seen in the foreground. The earliest probable tenant who we can place in the property appears to be on Ellen Fox who appear to have been trading there as a milliner in 1871 61. Miss Fox can be identified then as born in Ireland in about 1841 although further identification, before or after that date, has not been possible. What is known is that, by the time of the transfer of the property from Roberts to Doar in 1888, the tenants were the Misses Anne and Sarah Lowe, two of the daughters of John & Ann (née Shilcock) Lowe, who developed their early dressmaking talents into a successful millinery business 62. This enterprise was conducted from 8 High Road up to about 1901 when it moved across the Square to a prominent position alongside what was than the London City & Midland Bank (now part of the site of HSBC). It will be recalled that the Lowe sisters were previously mentioned as the sisters of Jane Lowe who married William Heard, the long-term occupant of 5 Church Street. 63. William Oldham, born in Beeston about 1828, the son of Joseph Oldham, a framework knitter and his wife Sarah (née Hall), had been able to develop a carting business from simple beginnings 64 , despite considerable personal setbacks. He married twice, his first wife, Harriet (née Walker), having died in 1858, while the two sons, George and John were still infants 65. Sadly, it seems, his second wife, Mary (née Smith), also died during or following the death of her third child Joseph in 1867. 66. The two sons from his first marriage - George and John - and the one son from his second marriage - Joseph - all involved themselves in the carting business. At first, this operated from their family home on the north side of the Square - probably Roundhill Cottage 67. - but, by about 1904, as we have seen, they had opened an office at 8 High Road, trading as haulage contractors, coal merchants and cab proprietors. Although, it seems that William, the father, had died in 1901 68 and that all three sons were involved in the firm - indeed, Joseph Oldham is believed to be the one pictured as driving the leading cab 69. - the trading name continued as "W & G Oldham". In the event though, the life of the partnership was short and it was destined not to survive the changes that occurred with 8 High Road in 1907 which we shall describe below. While what remained of the cab business was continued by John Oldham from a base on Chilwell Road, George found work as a furniture remover and Joseph set up as a grocer 70. Doar's Property at 10 High Road - as we have seen, in 1888, John Frederick Doar had acquired the whole of the property under discussion, from his previous employer, William Roberts. The part that became number 10 High Road was to become the base where three generations of the Doar family were to trade as grocers, right up to the time of development of the present-day shopping centre on the site; for much of the time, it was also their home. Frederick William Doar (1875-1941 - shown right) became the next member of the family to operate the grocery business in The Square, taking over from his father before 1901. More about him and his family appears below 72. Annie Sophia Doar (1876-1923) worked as a bookkeeper for her father before marrying Arthur Freeman, a clerk, and moving to Coventry. Arthur was the son of George Freeman who was the caretaker and attendance officer at Church Street School, Beeston and later became the Registrar of Births & Deaths in Beeston. They had three children 73. Mary Isabel Doar (1878- ) married William Taylor, an iron founder, in 1902. The couple lived in Sandiacre where they raised at least two children 74. Harry Cyril Doar (1880-1959) worked in banking, eventually becoming the manager of the Westminster Bank in Alfreton, Derbyshire. In 1905, he married Hilda Hammond and they had one child before her death in 1907. In 1912, he married Mary Carlin with whom he had three children 75. Alice Mabel Doar (1881-1953) married Alfred Towlson who became the Head Clerk in a Building Society. They had one child, a son 76. Lilian Yeomans Doar (1886-) married Herbert Baker in 1916 77. 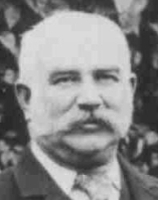 By 1901, John Frederick felt able to hand over the day-to-day running of the business to his oldest son, Frederick William, then aged about 26. It was clearly well-established and financially stable. As we have also seen, the purchase of the property from Roberts had been financed, in part, by a mortgage of £1,600 to Roberts himself. In 1890, Doar had been able to repay £600 and a further £500 in 1895 with the balance settled 'in his lifetime' 78. With the business on a firm footing, John Frederick and the remainder of his family were able to retire to Sandiacre, Derbyshire where generations of the Doar family had lived. It was to be a short retirement; on 10 February 1902 he died, after suffering a stroke 79. Frederick William Doar (1875-1941), as we have seen, had taken over the management of the business in about 1890. In 1907, apparently as part of a series of transactions to settle his father's estate (see below - 'The 1907 Sales), he acquired the property known as 10 High Street together with that on the corner of Station Road, together being the grocery shop and associate living accommodation, as well as the property on Station Road itself (Parcel A on our plan), from this father's estate, for £1500. This was partly financed by a mortgage of £1000 from his youngest sister, Lilian Yeomans Doar. 80. The photograph (left) shows the premises at about this time. The entrance on the corner of Station Road can be seen clearly with the part that was 10 High Road on the extreme right beyond the shop front. The upstairs living accommodation can also be seen clearly. The grocers shop was run on traditional lines with sugar, currents, rice, etc all weighed out from bulk and bagged for sale, Butter, cheese and the like were bought in large pieces and cut to the customer's requirement, Tea was displayed in large containers and there were large bins of cereals, beans and fried peas ready to be scooped and weighed as required. Biscuits were arranged in 7lb tins and coffee was ground to taste and requirement - and the aroma permeated the premises as only coffee can. Sides of bacon hung from the ceiling and treacle and vinegar were available from bulk. There was soap of all kinds, home made baking powder, food for poultry and a range of dog biscuits meant that customers' faithful friends were not forgotten ! Shopping in that era was a serious business, not to be hurried and customer service was handled with great care - with chairs provided for ladies to sit while they discussed their order. In the yard, out at the back, accessed from Station Road, was a large stable, open sheds for two horse-drawn delivery vans and a hay loft. Two horses were kept during the early days when a bread round was a feature of the business but this was later dropped and one of the horses was retired. This was an era when customers expected prompt delivery of their orders and a delivery boy filled in when requirements did not fit into the regular rounds. Weekly orders were collected on a regular visits from customers from as far away as Chilwell and Attenborough as well, of course, from the Beeston area. In 1900, Frederick William Doar had married Annie Elizabeth Kirkby, the daughter of Samuel Kirkby and Annie (née Thornhill) and granddaughter of William Riley Thornhill, part of the long-standing family firm of tailors that traded on Beeston High Road throughout much of the 19th century. Hilda Ann Doar (1901-1999) married Arthur John Pollard, the lace manufacturer and owner of Swiss Mills. The couple had six children 81. Mabel Doar (1903-1992) married Frederick Joseph Beresford and emigrated to Melbourne, Australia shortly after. The couple had two children 82. Constance Doar (1904-1997) married Alfred Campbell and emigrated to Canada. They had three children 83. Phyllis Doar (1906-1996) married Conway Wilfred Wingfield and moved to Essex. They had two children 84. Frederick Doar (1907-1998) married Rowena Aileen Brough, a daughter of George Brough, the local housebuilder, and his wife Emily. They had one daughter. Frederick took over the running of the family business in around 1930, continuing up to the time it closed in the early 1960s 85. The 1907 Sales - after the death of John Frederick Doar on 10 February 1902, probate of his estate was granted, in the following May, to Abraham Charles Doar of Sandiacre, the brother of the deceased and to William Dix Yeomans, his widow's brother. Although his household effects were left to Sophia, his wife, in the event she died shortly after, on 25 May 1902. The residue of the estate was left, apparently in trust for the heirs, to Abraham Charles Doar. As we have seen, the grocery shop and associated property was purchased by Frederick William Doar, John Frederick's oldest son. The remainder of the property was sold to others, outside the family. It was a watershed moment in the evolution of the south side of the Square, the beginning of changes which were to shape that part of Beeston over the next 60 years. At the centre of this was 6-8 High Road which was sold on 30 September 1907 to Boots Cash Chemist (Eastern) Ltd and it was here that they built what was for many years, for many Beeston people, their favourite shop. It was built in a mock-Elizabethan style that had become a design favoured strongly by Jesse Boot, the founder of the iconic business that is still one of the best known brands on the High Street, up and down the land and, indeed, around the world. The story of how Jesse Boot built up his parents' herbalist business to a huge commercial empire is well known and well documented 86. In his early years he was successful in using innovative marketing to transform the selling of medicines and related products, driving down prices and breaking existing monopoly practices to make them more widely available to a mass-market. He was 27 when he took control of the family business in 1877, and already the company had taken off - but now, the growth was phenomenal. Within just eight years he had set up a manufacturing facility at the famous Island Street site in Nottingham and set about developing a chain of shops, first throughout the East Midlands and then throughout Britain. He worked at a tremendous pace, always 'hands-on' and this eventually overwhelmed him, such that in 1896 he was forced to take time out in the Channel Islands. It was here that he met Florence Rowe, the daughter of a bookseller. whom he married and, together, they returned to continue the development of the Boots empire. It was a perfect match - with Florence bringing her own ideas to the business - notably the introduction of improved employee benefits and in 1898, a masterstroke, the development of the Boots Booklovers Library within the stores. By 1890 the network was limited to 10 stores in the east Midlands. By 1914, this had been built to more than 500, spread throughout the land. 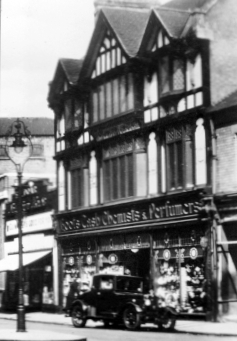 This was growth on a phenomenal scale - another shop opened every 10 days - and it was in the middle of this period, in 1907, that the Beeston shop was opened. The shop's design, typical as it was of Jesse Boot's architectural taste, was almost certainly by Michael Vyne Treleavan, a Cornish-born architect who had been hired by Boot in 1900 to head up the company's Building & Shopfitting Department. This was of particular significance for Beeston as it was here that the Treleaven family lived from the time of his taking up the appointment until at least 1912 - at first at 11 Linden Grove and later at 228 Station Road 87. A few days after the sale to Boots, on 9th October 1907, the properties at 2-4 High Road (then occupied, as we have seen, by James Monk and Bernal Stevenson respectively) were sold to John Blatherwick of Chilwell for £1525. Blatherwick was then the landlord of the Chequers Inn in Chilwell and had previously kept, in turn, the Malt Shovel and the Crown Inn in Beeston 88. The properties were clearly bought by Blatherwick as an investment as they continued to be occupied by tenants. 2-4 High Road After 1907 - as mentioned above, these properties had been purchased as an investment by John Blatherwick as part of the 1907 sales from the Doar estate. Blatherwick died a few years later, on Christmas Day, 1912 and the properties were sold again, in June 1913, to Joseph Woodhouse, a Chilwell farmer, for £1390, who continued to rent them to tenants 89. Number 4 remained in the tenancy of Bernal Stevenson while, at some point, the tenancy of number 2 was taken by Annie Louise King who continued to run it as a sweet shop and tobacconist, Just before he died, in 1921, Woodhouse sold both properties to Annie King in October 1920, for £1500 90. In 1933, Boots Pure Drug had been brought back into British control after a period of American ownership, following the sale to United Drug Company in 1920. This, it seems, resulted in the Company to seeking expansion of its retail outlets and, in Beeston, it was able to acquire from Annie King, in September 1934, a 50-year lease on the adjacent property - 4 High Road 91. This enabled the company to enlarge the existing building by adding an additional matching section onto the 1907 building (this can be seen on the photograph on the left - albeit taken in the mid 1960s when Boots had moved out and the building was occupied by temporary tenants pending redevelopment. The new section is on the right hand side of the building, clearly additional to the symmetrical 3-bay original building. This is the building as it will be remembered by most older Beestonians with a ground floor devoted to traditional medical and toiletry products and ornate stairs leading to a floor devoted to fancy goods, a photographic section and - that favourite of Florence Boot - a subscription lending library. Various photographs, shown on this page, illustrate the development of the Boots store and the buildings either side. The one shown above right is dated about 1910, just after the Boots store had opened in 1907. To the left is the Doars living accomodation and shop on the corner of Station Road (then Brown Lane). On the left there is a glipse of Bernal Stevenson's fish and poultry shop (part of his name is visible on the blind). 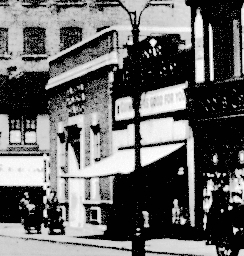 The photograph shown above left is later, about 1933, with Boots still in its original form but the National Provincial Bank now on the corner of Station Road with the rebuilt Doars shop next door (see details below). 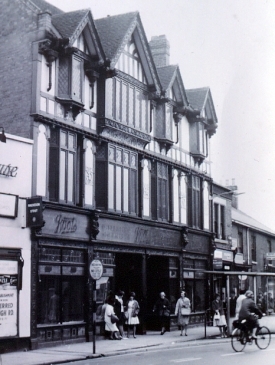 The photograph here left, shows the Boots building and the other shops, mostly vacated by the original occupants, about 1964, just prior to demolition. The redevelopment of number 4 still left number 2 in its original form - and, as may be seen in the photograph, this continued to be the case right up to the comprehensive redevelopment of the whole area in the 1960s. It seems that Alice King continued in the shop until, aged 64, she retired in November 1950, having leased the premises and sold the business to Alice May Bond who, it will be remembered by many, continued operating there until redevelopment 92. In May 1951, Annie Louise King married, for the first time, to Thomas Stone Hall who, it will be remembered from our study of nearby Church Street properties, was then the owner of the Bowley & Hall property at 7 Church Street. In October 1954,Mrs Hall sold the freehold of what had previously been number 4 to Boots Pure Drug for £3250; this, of course, had previously been leased to Boots and was the site of the 1934 extension of the store. In November 1955, Annie died, leaving her husband as beneficial owner of the remaining of the two properties - number 2. Thomas Hall died in June 1960 following which ownership of the property became vested in Margaret Ethel Birks, a niece of Annie (King) Hall 93. The Next Doar Takes Over - by 1932, Frederick William Doar was 57 and looking to retire. His only son, also Frederick William Doar was aged 25 and about to marry Rowena Brough, the daughter of the local housebuilder. It was the right time to handover so plans were made for change, although, just as when he took over from his father, this transfer did not involve all of his property. This time, in September 1932, a month after the marriage just the shop at 10 High Road was transferred to his son. The part of the property on the corner of Station Road had been sold in October 1931 to the National Provincial Bank. 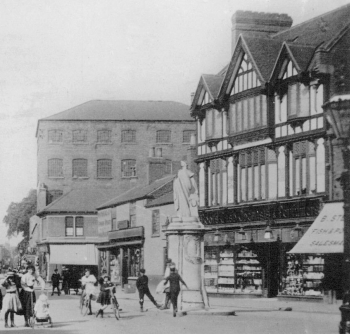 The bank building on the corner (see left, and compare the scene that in about from about 1907, shown above) became a local landmark for over 30 years, before it too was acquired by the Council and demolished during the 1960s redevelopment. At the same time, the opportunity was taken to rebuild 10 High Road as the new shop and more appropriate in style to the adjacent premises. Now it was a single-storey structure with a facade complete with an ornate sign 'Nottingham House' - the long-standing name that the family had given the premises (See photograph on the right from about 1934). Whatever the extent of this rebuild, there was no change in the personal service offered and, as the writer can testify, the aroma in the shop remained and can be easily recalled even today, However, the sale of the corner property and rebuilding of the shop area brought a particularly significant change for members of the Doar family who were now able to spend their home lives elsewhere in Beeston, away from the shop. Also around this time, the family developed a row of shops with accommodation over on the strip of land (Parcel 'A' on the plan of the 1988 acquisition) on the west side of Station Road, immediately behind the new bank building.. 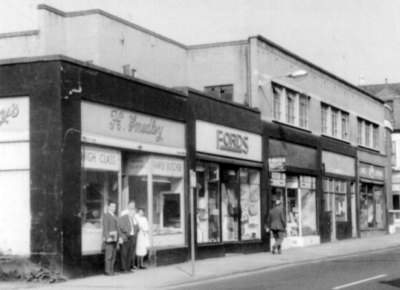 These shops will be remembered by many older Beestonians for their later tenants which included Mr Graham the men's hairdresser, Smedleys the butchers, a traditional open-fronted wet fish shop with a large tiled counter and Fords the household linen shop(see left). These too survived until the overall demolition of the site. 1960s Redevelopment - by the early 1960s, the local council - then Beeston & Stapleford Urban District Council - had begun to examine options for the redevelopment of the area of central Beeston, south of The Square, bounded on the east by Station Road, on the south by Middle Street and on the West by Styring Street. The proposals involved the total demolition of that whole area and the building of a new comprehensive retail development. It would result in the total destruction of Chapel Street, a narrow lane running between what was then the top of Church Street and Middle Street, the closing of the top of Church Street so that it no longer opened into The Square and the demolition of the old Town Hall building. All of the buildings which are discussed on this page - including the popular and attractive Boots building would vanish under the proposals. These were big changes to an area familiar to all Beestonians, changes that were at least as extensive as the recent Tesco redevelopment and were, not surprisingly, controversial at the time but they eventually got the go-ahead. The Council used its statutory powers to acquire all the land required and entered into partnership with a development company, Second Covent Garden Property Co Ltd - to build the shopping centre - 'The Square' - that survives today - albeit subject, once again, to proposals for another round of redevelopment. 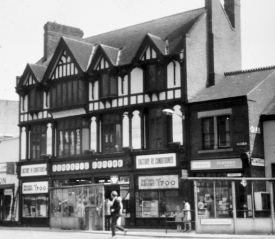 The Boots building was sold to the Council in August 1963 and the company opened a new store at the location it still occupies on the High Road nearly opposite the top of Acacia Walk. This new location was part of the retail development which had then recently taken place on the site of the Palace Cinema and the Conservative Club. 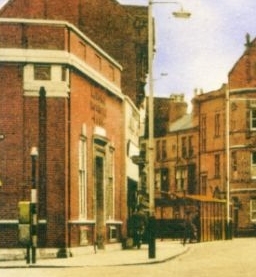 At that time, the cinema closed and the Conservative Club relocated to new premises on Acacia Walk 94. The stylish Boots building in the Square, stripped of its corporate identity (see right) was let temporarily as a domestic appliance outlet (see above left). In the picture it was offering 'factory re-conditioned washing machines' for £7. Frederick Doar sold his premises to the Council in June 1963 and, for a time, the business re-opened on the opposite side of the Square at 13 High Road. The vacated property was let by the Council to Trevor Nelson, a well-known local second-hand furniture dealer, for one year from December 1963. This was the situation at the time of the photograph which appears on the previous page. By the end of l964, all of the other owners of the properties on the south side of the Square - including 1-7 Church Street and the Bank on the corner of Station Road - had also sold to the Council although, it appears from the photographs taken at that time, that many of the occupants were permitted to stay up to the time that demolition took place. No doubt, the Council was keen to keep up the appearances of that side of The Square while clearance and rebuilding proceeded to the rear. By the beginning of the 1970s, The Square Shopping Centre was fully opened and continues, still much as it was then, although once again (in 2011) we await news of more changes. 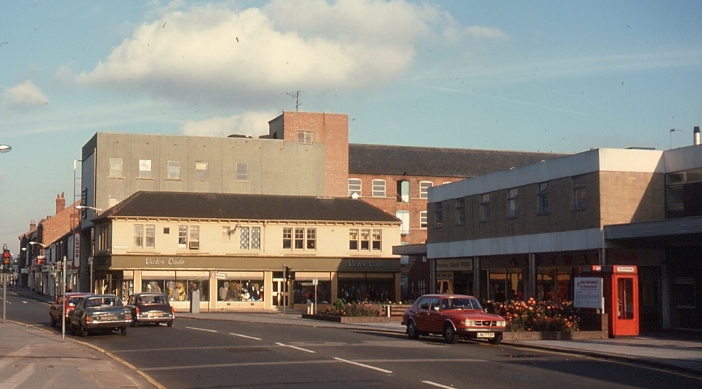 The picture shown below, taken in about 1982, reminds us, however, that there has been subtle changes in the 40 years since the area was redeveloped. Then, there was two-way traffic through the square - and, indeed, along the length of the High Road. With pedestrianisation, the raised flower beds were cleared away, a controversial piece of sculptor appeared and a more fitting raised feature arrived somewhat later. Although the shopping mall itself had a bit of a facelift about 10 or more years ago, it is certainly due for some more radical action. As we have seen, this area has responded over the years to changing needs and to establish itself as Beeston's natural centre. It will, no doubt, do so again.